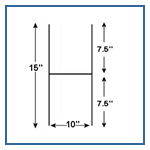 10 inches wide x 15 inches tall sign stake: Recommended for corrugated yard signs. The 15 inch H sign frames are welded for strength. Just slide your corrugated signs on to the wire frame and you have a quick installation. Corrugated plastic signs are easy to display with these sign stakes. Simply mount the sign on the stake than put the sign stake into the ground. No mounting hardware needed. Once installed the signs will sit low to the ground.